When snow stays on the roof, it’s the homeowner’s responsibility to remove it. However, with an industry divided between shoveling the roof and letting the snow fall on its own pace, it’s difficult to assess which is the better option. Soon enough, the word “responsibility” has grown vague. Then again, if you’ll look at things in a different way, “responsibility” isn’t limited to just shoveling snow off the roof. It’s more on making the right decision on how to remove snow: shoveling from ground level, using deicing salts, contacting a removal service, and— more importantly— having code-compliant roofing in Tinley Park, IL. Illinois still sticks with the 2003 International Building Code as far as snow load is concerned: 15 to 30 lbs per square foot of roofing. Unfortunately, it’s difficult to find out whether or not there is enough snow on the roof to warrant snow removal. In addition, you have neither the time nor need to do some calculations; that snow has to go. Snow removal is a fairly common activity up north. 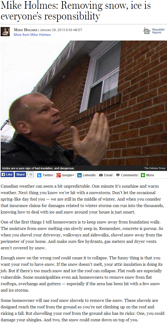 Homeowners simply see very thick snow on the roof as their reason for grabbing the shovel. However, take note that these measures come with their downsides. For starters, slabs of snow can come down on you or get somebody hurt. Deicing salts are also effective solutions, but they’re usually effective at temperatures no lower than 9 degrees Celsius below zero. Also, by using salts, you run the risk of killing plants as soon as the snow falls and seeps into the ground with the salt mixed in. Having code-compliant roofing in Evergreen Park, IL works just as well. However, if you choose to let the snow slide instead of doing something about it, you’re responsible for keeping the roof in tiptop shape. When the sun shines, the warmth should let the snow slide off with ease. In the end, “responsibility” means making a choice and dealing with its pros and cons. Roofers like Rogers Roofing can bring you the benefits of code-compliant roofing, but be ready for the associated costs.